The challenge with the Junior Nationals this year is the venue. The NSA in Toronto was scheduled to host the event, but has since closed their doors. So the Mayfair Parkway stepped up and did a good job with little time to prepare. Since the last time I was at the Parkway they have take down 2 or 3 courts and put in a mini basketball gym. So unfortunately this meant that this event now needed a 2nd facility which was closely at the Mayfair East club. The challenge with the East club was that there was often nobody at that club to organize anything and the courts were much different. At the East club the courts were panel and quite warm and bound. The kids had to adapt their tactics, be patient and fit if they were going to do well on these courts. Back to the host club, the Parkway. For anyone that has been there knows the challenge of trying to coach on any court besides the 2 show courts. I brought 9 kids to nationals but only had 2 of the kids ever play on the show courts, so I watched a lot of the matches through a tiny 1 foot window at the backdoor of the courts. Less than ideal for watching, but the only other option was to go upstairs and then come down between games (which wasn't very close). So this was a challenge for us as coaches. Another problem with the viewing is that this means I didn't get to watch much of the other matches. But today I'm going to write about the bit that I did see. I watched many of the finals on Sunday. There was some contrast of styles between attacking players and retrievers. 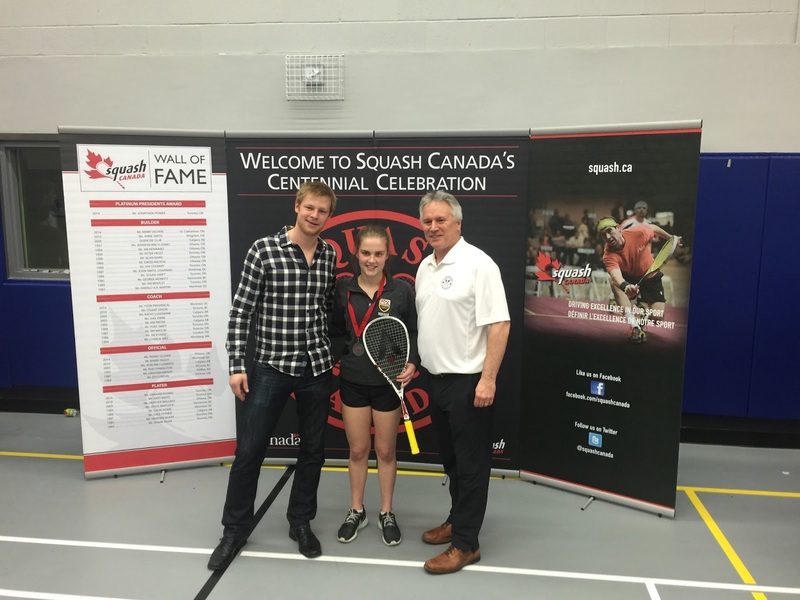 I felt that the caliber and depth was reasonably high for the boys and in the lower divisions for the girls. Watching the boys play it always amazes me how they can cover the court and hit with such a consistent high pace. There are some good athletes on the boys side. It's funny how players develop as either retrievers if they're fast or attacking players if they don't move quite as well; it's quite rare to be highly skilled in both areas. What I didn't see from most of these top boys was changing the pace and angles of their length. They all liked to hit the ball so low and hard and it just wasn't putting pressure because it wasn't tight or deep enough. A few of the boys had good shots and were very attacking, while some of the other ones showed an amazing amount of patience and just kept the ball in play trying to extend points and wait for mistakes. There are definitely some kids that have loads of potential here in Canada, but are still quite unpolished when it comes to tactics, attacking and their mental game. There was still too many discussions between the refs for my liking. I just felt like the top boys in some of the top squash countries around the world would be more polished, more clinical with their attacking shots, more focused mentally and would be better able to adjust their tactics within a match. I feel like most of the top boys have the ability and desire, have good swings, are physically fit and hit with good pace, but there is a lot more to squash than this. I really believe that the mental game and advanced tactics are crucial for continuing to improve your game. We have some great coaches in Canada, but maybe it's the lack of competition the top boys are getting. It will be interesting to see how they do when they go to the worlds this summer. They will probably be underrated, but I do feel they have good potential yet still a long ways to go! One bright spot for me was seeing how many great young 10 and 11 year old boys were playing. 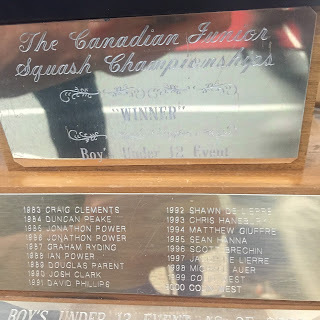 I still don't get why Squash Canada doesn't have an under 11 division. I bet some of the 11 and 12 year olds wish the younger kids had their own age group. 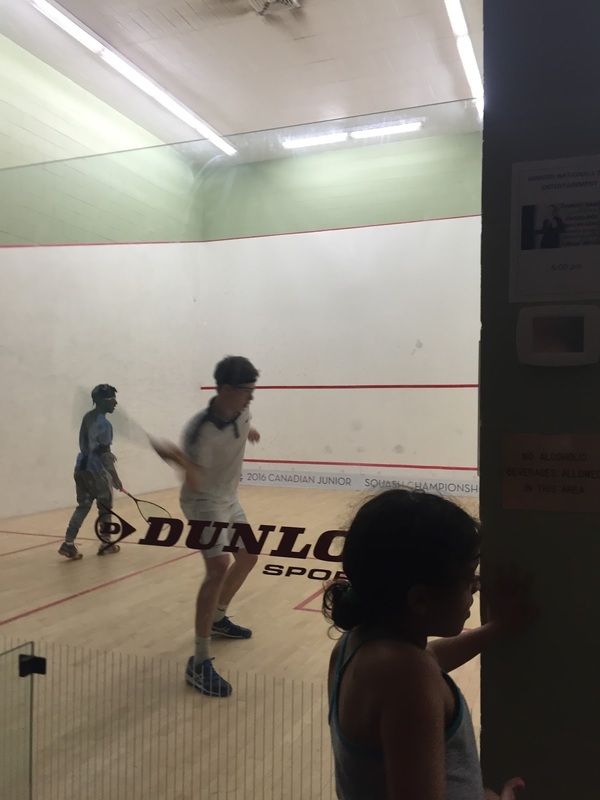 The depth of talent at this age is way stronger than when I was that age, but it's the next few years that will shape their squash careers. 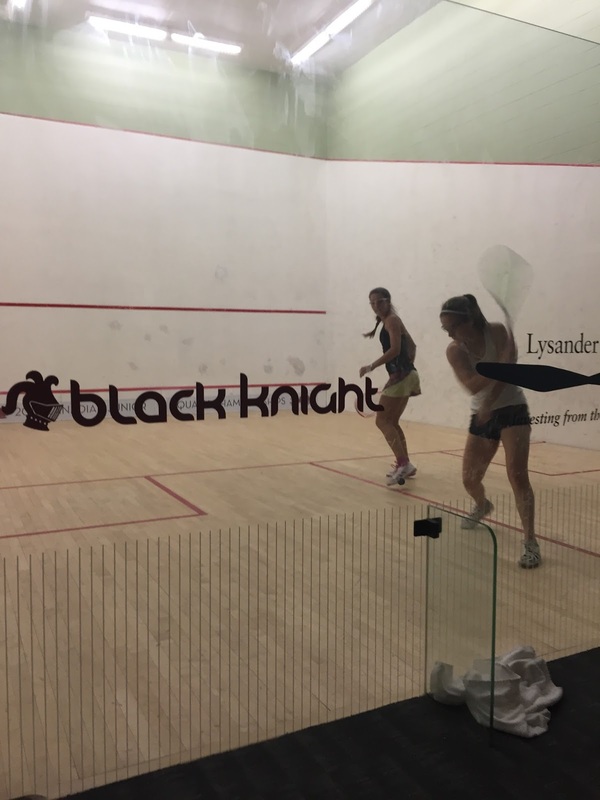 Are they dreaming of becoming world champions or will those dreams be pushed aside by those closest to them and will they settle for making a strong varsity squash team? I think these young kids need to get some exposure internationally. When I was in Penang last year the size of the under 11 draws were huge and their skills were generally amazing for their size and experience. I feel like the Long Term Athlete Development program may work for keeping more kids in the game, but not for producing professional word class level players. I wonder if Canada will ever see another Jonathon Power? On the girls side I was again quite impressed with most divisions. I feel like there was less depth in the under 19 than in previous years, but that is likely because some girls are away at university at 18 and can't make it back to compete. One of the girls from the school I coach at came 2nd (pictured above) and is probably mentally the toughest most focused junior player I've ever seen. She had been sick and not able to prepare properly, but still made the finals and for awhile I thought was going to win it! The younger age groups showed great promise and the best depth I've ever seen for the girls game. Even some of the under 13 girls could really crack the ball, made good decisions and were quite accurate. Each age group up the girls began hitting the ball with more pace and they all seemed quite strong mentally. I felt like they handled adversity well and stayed pretty positive even when the pressure was on. There were many extremely tight semis and finals on the girls side. I just wish there was a step for them after juniors. That's really the biggest challenge. 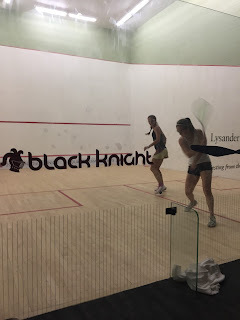 College squash works for some, but I don't see many of them going through that and then trying to compete professional. Maybe many of them are only focused on making it to a good college program. I'm sure like there are some Canadian kids dreaming of pro squash, but much less than other countries. I imagine thousands of kids in Egypt wanting to grow up and be the next Ramy Ashour or Nour Elsherbini. I know Nicol David has had a huge impact on the growth of the game in Malaysia. So who do we look up to? It's still JP, but now the young kids don't know who he was and have never seen him play. We need a role model to help motivate our youth and give them hope that they too can achieve their dream if they work hard enough. The challenge here is that I don't think it's possible for a top world player to make it in Canada. They won't get the competition or the funding. Canada isn't cheap and flights are expensive. How can they afford proper coaching? How can our top players get access to important resources like sport psychologists, personal trainers, physiotherapists, massage therapists, nutritionists and so on? If I was going to try and do it I would go to Europe and play in some of the pro leagues to get the matches and make a bit of money and get better competition. I also know a lot of people have been travelling down to Florida to work with David Palmer. Hopefully one day we can have something set up in Canada that will allow top world class players to be based here. That's what the NSA was supposed to be, but that didn't work. Until we make some changes and improve our high performance pathway I'm afraid that we will continue to perform at a mediocre level internationally.